The Unite union has said it is seeking legal advice about whether the Home Office "incited racial hatred" by sending vans around London encouraging illegal immigrants to "go home". Its leader, Len McCluskey, called the poster-covered vehicles "vans of hate". Nick Clegg has criticised the pilot scheme, but the Home Office has said the message was not racist. Meanwhile, new peer Doreen Lawrence has said police stop-and-check operations focus "mainly on people of colour". The Labour-supporting mother of murdered teenager Stephen Lawrence, told ITV's Daybreak she thought "racial profiling" was involved - a suggestion rejected by ministers. The controversy comes after it was revealed that nearly 140 people had been arrested in a wave of raids aimed at tackling people working illegally in the UK and firms employing them. The Home Office's week-long immigration publicity pilot scheme involved six vans driving around north London, carrying a board asking: "In the UK illegally?" The poster continued: "Go home or face arrest." It supplied a text messaging number for those seeking "free advice, and help with travel documents". The pilot scheme only ran in six London boroughs and lasted for one week, but the political fall out has been much wider. Unite leader Len McCluskey wasn't alone in condemning the vans. Labour branded the scheme "stupid politics from a government not getting the basics right on immigration". The coalition is split on the issue. Nick Clegg criticised the scheme and was clear that no Liberal Democrat had given it their approval. But Number 10 defended the pilot, which it insisted was working. UKIP leader Nigel Farage, in favour of a tougher stance on immigration, described the message on the vans as "nasty and unpleasant". He said it was clearly aimed at encouraging people not to vote UKIP. The Home Office insists the "go home" message is aimed directly at illegal immigrants. But perhaps the wider message it wants to convey is that this government is serious about tackling illegal immigration, which is likely to be a key battleground in the run-up to the next election. The Metropolitan Police told the BBC it had received a complaint from a person in the London borough of Hounslow. A spokesman added the complainant had been spoken to and advised that the matter had been "recorded as not a crime". Speaking on Wednesday, the deputy prime minister said he was "very surprised" to see vans "driving aimlessly around north London" telling illegal immigrants to go home, and that they were not a "very clever way" of tackling the issue. Mr Clegg told BBC Radio 5 live that no Liberal Democrats - including Home Office minister Jeremy Browne - had known about the pilot scheme in advance. 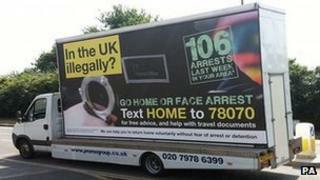 Downing Street had said the vans had been approved by the "Home Office team". No 10 also said on Monday that the pilot scheme using the vans had worked, although the Home Office said it was too soon to make a final assessment as a poster and leaflet campaign was continuing. Separately, Mrs Lawrence - confirmed this week as a Labour peer - spoke out against a scheme where spot checks have been carried out near railway stations as part of a crackdown on illegal immigration. She said: "Why would you focus mainly on people of colour? "I'm sure there's illegal immigrants from all countries, but why would you focus that on people of colour, and I think racial profiling is coming into it." Some 139 people were arrested at locations including London, Durham, Manchester, Wales and Somerset. The Equality and Human Rights Commission said it was writing to the Home Office to ask whether any "unlawful discrimination" had taken place. A spokesman added: "The letter will also ask questions about the extent to which the Home Office complied with its public sector equality duty when planning the recent advertising campaign targeted at illegal migration." Labour said enforcement operations must not be "based on ethnicity" while the UK Independence Party said the raids appeared to have been "heavy-handed". But immigration minister Mark Harper rejected claims of racial profiling, saying operations were intelligence-driven and officers had to have reasonable suspicion that an offence had been committed to arrest someone. "We don't have the legal power...and we don't have the inclination to just stop people at random," he said. "I am confident everything we have been doing has been both lawful and proportionate to the offences we are trying to deal with." The rules of engagement for immigration officers were published on the Home Office website, he added, and he was confident that officials were complying with them. He added: "The public want us to take firm action against people who are in the country illegally and have no right to be here."